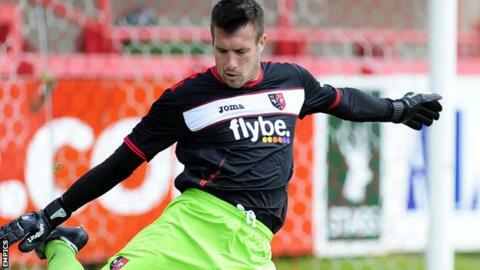 Exeter City goalkeeper Rhys Evans has spoken of his relief at playing his first match for 18 months. The 30-year-old former England Under-21 goalkeeper made his debut for the Grecians at after a long recovery from a knee injury. "It was very much a relief and it was a moment I'd been aiming for, and looking forward to, for a long time," Evans told BBC South West Sport. Evans had feared his career may be over after undergoing incorrect treatment. He had a bad tear in his cartilage while at Southend, with his last appearance before this week coming in March 2011, and the former Chelsea youngster was fortunate enough to get help from his old club as part of his rehabilitation. "Somewhere along the line I got sent down the wrong road. "I went a long way down the wrong road and caused myself a lot of problems. "At Christmas I thought that was me done for." But since coming to Exeter he has been injury-free and has struck up a healthy rivalry with incumbent goalkeeper Artur Krysiak. Krysiak has come in for criticism from some sections of Exeter's support for mistakes in recent games but Evans is full of praise for his Polish counterpart. "I've got nothing but praise for Artur, he's a good guy and he works hard," he said. "We've got on well in the time we've been together. "I felt for him, especially in the first game and felt uncomfortable how that developed. "Nobody goes out to make mistakes or play poorly and I'll make a mistake when I'm playing, but it won't be for the want of trying to do the right thing."